Heimars World: Samstag ist Badetag !! !/ Saturday is bathtime!!!! Samstag ist Badetag !! !/ Saturday is bathtime!!!! ...und was gibts Schöneres als so ein richtiges schönes Schaumbad *kicher*. Und der Sketch ist der akutelle von Sketch Saturday. The bubbles are completly colored with Stickles Baby blue*gggg. And this is the actual Sketch Saturday Challenge. Hihi... so funny this card!! 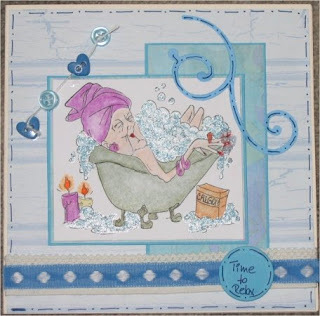 Oh what a fun & fab image Heidi, love your card. Thanks for joining us this week at SS ~ Enjoy the rest of the weekend.